Our studio apartment with soaring 12-foot ceilings and mountain views is conveniently located right in the village of Crozet. It comfortably fits two with a queen-size bed, sitting area, full kitchen and full bath. Designed for full-time guests. Whether you are visiting family in the area, vineyard hopping, here for a wedding or a hike along the Blue Ridge, The Square is the perfect place to begin and end your day. With commercial space on the ground level and apartments above, The Square is the perfect location to stay in Crozet. Once you settle in, step outside for a stroll down to Crozet Park or over to the Crozet Library. Stop in Fardowners for a meal, a beverage, and some local music. Maybe you’d prefer a pizza or calzone from Crozet Pizza/Pourhouse. All are within walking distance to The Square. For breakfast, you can’t beat the Mudhouse where the coffee is roasted locally and the goodies are baked right there in the kitchen. NO PETS WITHOUT PRIOR APPROVAL. PLEASE DO NOT LEAVE BARKING DOGS UNATTENDED AS IT DISTURBS THE SALON GUESTS ON THE MAIN LEVEL. Ross and Amy are long-time residents of the area. Ross grew up in Greenwood, went to Elon College (now University) and returned to Charlottesville upon graduation to join his great-uncle in real estate. Amy grew up in the Shenandoah Valley, moved to Charlottesville to attend UVA and after graduation, couldn't leave! We love living here. Our real estate office shares the upper floor with the apartment and we live in nearby Sugar Hollow. Located right in the village of Crozet within walking distance of restaurants and shops. Only a quick drive to local vineyards and breweries as well as the Blue Ridge Parkway and hiking. Full bath with shower stall. Stocked with towels, toiletries, toilet paper and hair dryer. Wintergreen Resort is located 19.5 miles from Crozet. Crozet is a small village located about 15 minutes from the City of Charlottesville. Crozet is located at the base of the Blue Ridge Mountains. There are mountain views from the windows of the lot. Queen-size sheet set on bed. Second set located in dresser. Bathroom is stocked with towels. Extra towels located in the dresser. Full-size refrigerator with freezer with ice maker. Full-size electric range. Kitchen is stocked with pots and pans. Silverware, glassware, dishware, cooking utensils and pots and pans. Wintergreen Resort is located 30 miles from Crozet. The apartment and our real estate office are located on the second level of our building. The ground level is commercial space occupied by Georgetown West Salon. The second level was once a toy store and was renovated in 2005 into two apartments. Our studio apartment features an open living area separated into sitting area with sofa and comfy chair and sleeping area with queen-size bed. There is a wide-screen HDTV with Comcast and local channels and wireless high-speed internet. The full kitchen is open to the rest of the apartment and features a full-size refrigerator, stove and microwave. Stocked with dishes, glasses and cookware. There is a full bath with stand-up shower. Towels, toilet paper, shampoo, conditioner and soap are provided. The loft was exactly as advertised: clean, close to amenities, and easy to access. Had a great time. My husband and I stayed here for a weekend and it was perfect. 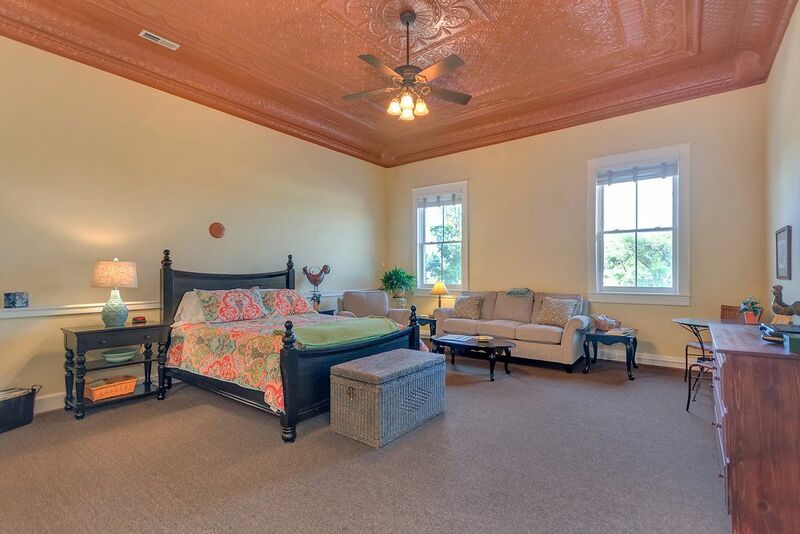 Crozet is a beautiful little town and this loft is located right in the middle. There are great restaurants and the view of the mountains was perfect! We can't wait to visit again! The owners of the loft were so helpful from the start. After, my husband realized he left a shirt there, I sent a message and had immediate response. The shirt arrived a few days later. The whole experience was wonderful! Thank you!! Perfect accommodations in the center of town! We stayed at the Loft over Thanksgiving while visiting family. It was the perfect spot for our family! Amy had everything we needed, the Loft was clean, and the bed was very comfortable with lots of pillows. Located in the heart of Crozet, above a gourmet coffee shop and down the street from a yoga and barre studio, this was a perfect home-base for us. We hope to get the opportunity to stay again, soon! Perfect for a long weekend getaway. The loft is adorable and is in a great location. We enjoyed coffee and breakfast at both local coffee shops and the restaurant, Fardowners, had great food, great drinks, and great people! It is a quick drive to any point of interest in the area. We loved it. Whether you are visiting family in the area, vineyard hopping, here for a wedding or a hike along the Blue Ridge, The Square is the perfect place to start and end your day. With commercial space on the ground level and apartments above, The Square is the perfect location to stay in Crozet. Once you settle in, step outside for a stroll down to Crozet Park or over to the Crozet Library. Stop in Fardowners, our local pub, for a meal, a beverage and some local music. Maybe you’d prefer a pizza or calzone from Crozet Pizza/Pourhouse. Both are within walking distance to The Square. For breakfast, you can’t beat the Mudhouse where the coffee is roasted locally and the goodies are baked right there in the kitchen. For breakfast, Green House Coffee makes a yummy chicken salad sandwich on local Goodwin Bakery oatmeal bread. Looking for something to do? Chiles Peach Orchard and Farm Market is open May through Thanksgiving and makes terrific cider donuts and peach ice cream. Pick your own peaches, apples, strawberries and pumpkins. King Family Vineyard, White Hall Vineyard, Stinson Vineyards, Grace Estate Winery, Pollak Vineyards and other wineries on the Monticello Wine Trail are great places to spend an afternoon. Starr Hill Brewery, part of the Brew Ridge Trail, is located right in Crozet and now has a brand new tasting room. Feel like a hike? Mint Springs Park, Sugar Hollow, Humpback Rock are all close by. Charlottesville, the University of Virginia, Monticello, Ashlawn-Highland and Wintergreen are conveniently located minutes from Crozet. Walk to local restaurants, the library, the park. Short drive to local vineyards, orchards, Blue Ridge Parkway and Charlottesville.